Should there be age limits for federal judges? A dialogue on when it’s time to remove jurists from the bench. 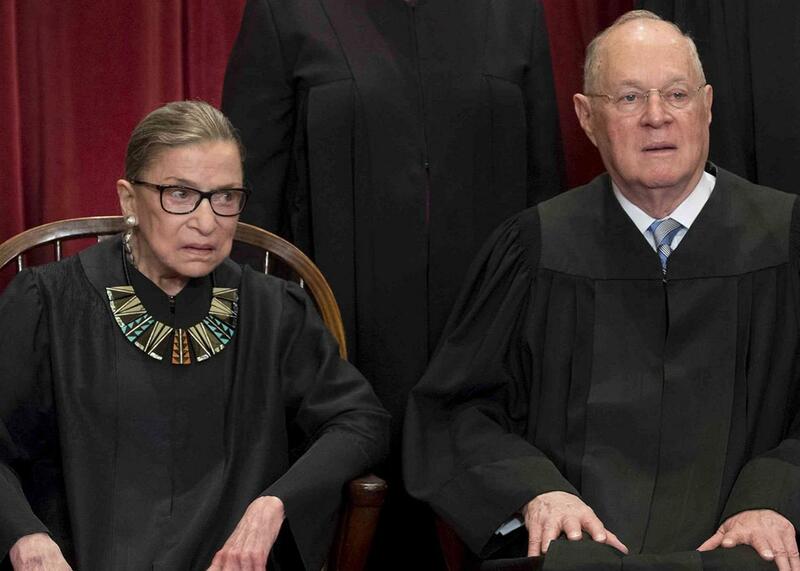 Supreme Court Justices Anthony M. Kennedy and Ruth Bader Ginsburg are among the oldest justices on the current court. Slate is running a series of monthly dialogues between two of the nation’s most esteemed jurists, Richard A. Posner and Jed S. Rakoff. These conversations will be moderated by Joel Cohen, author of the book Blindfolds Off: Judges on How They Decide. Their last conversation was about the law in a world of alternative facts. This month’s conversation is about whether federal judges should be subject to age limits. Joel Cohen: Let’s talk about age. President Trump, who is 71, has joined Ronald Reagan and Dwight Eisenhower as the only American presidents to serve in their 70s. When it comes to the federal bench, though, Trump will want to nominate younger judges so as to extend his influence far beyond his term as president, viz., appointing Justice Neil Gorsuch to the Supreme Court at age 49. Three of Gorsuch’s colleagues, meanwhile—Ruth Bader Ginsburg, Anthony Kennedy, and Stephen Breyer—are 78 or older. Under the Constitution, federal judges, having life tenure, can be removed only by impeachment and only for “high crimes and misdemeanors.” But should it be that way? While we know there are federal judges in their 80s and even 90s who perform admirably, shouldn’t there be mandatory retirement at a certain age? In New York, for example, there is mandatory retirement at age 70 for the judges of the state’s highest court, and a referendum to increase tenure to age 80 was defeated by popular vote in 2013. Yes, the two of you, in your 70s, are extraordinarily prolific and competent, but shouldn’t we want justice dispensed without concern that some judges may be losing their fastballs? Also, might there be a concern that judges of a certain age will become too dug in to their beliefs? Richard Posner: I believe there should be mandatory retirement for all judges at a fixed age, probably 80. Jed Rakoff: Life tenure is what guarantees federal judges their independence, enabling them to speak their minds freely, administer justice without fear or favor, and provide necessary checks on the other branches of government. Any tampering with this is likely to devolve into politics, with whichever party is in power trying to reduce the retirement age ever lower, so as to replace judges appointed by the now out-of-power party with those of the now in-power party. The recent defeat of the New York referendum that Joel references above is a good example: Even though there was widespread “good government” support for increasing the retirement age to 80, the referendum was successfully opposed by Gov. Andrew Cuomo, who wanted to replace Republican-appointed judges with judges he could personally select (as he subsequently did). The result was that several of the most experienced, most knowledgeable, and most respected judges on the highest New York court—such as Robert S. Smith, a Republican appointee who commanded bipartisan respect for his brilliance and fairness—were forced to retire at the height of their powers. The list of federal judges who have served with great distinction into their 80s includes, among many others, some of the greatest Supreme Court justices ever, such as Louis Brandeis (82), William J. Brennan Jr. (84), Hugo Black (85), and Oliver Wendell Holmes Jr. (90). The greatest Supreme Court justice of all, John Marshall, who single-handedly provided the foundation for most of the basic principles that still govern the relationship between the federal judiciary and the other branches of government, served until he was 79, which, by modern standards, would be the equivalent of something like 95 or more. And, contrary to Joel’s hypothesis that elderly judges “become too dug in to their beliefs,” the number of Supreme Court justices (as well as lower court federal judges) whose views have evolved as they got older and served longer is very large and includes, just in the past few decades, such influential justices as Harry Blackmun, John Paul Stevens, and David Souter. As for those (relatively few) federal judges who develop significant mental infirmities with increasing age, they typically receive a visit from the chief judges of their courts, who politely suggest that they retire—which they almost always do. Posner: If I may tune in, briefly, Blackmun, Stevens, and Souter were not giants. Nor was Brennan, although he was both able and influential, as indeed was Stevens—until he wrote a ridiculous opinion in Clinton v. Jones. Anyone think there’s a giant or giantess on the Supreme Court today? Let me say a word about Brennan, for whom I clerked in the 1962 term of the Supreme Court. He had been a very able labor lawyer, a colonel handling financial issues in World War II, and a member of the New Jersey Supreme Court when it was an elite court under the leadership of Chief Justice Arthur Vanderbilt. But when he was appointed to the U.S. Supreme Court in the late 1950s and arranged for Professor Paul Freund to appoint his law clerks (Brennan did not interview them), he decided to leave most of the work for them (for us) to do. I don’t think one can place him on the same level with his Supreme Court contemporaries Frankfurter and Black. On the other hand, I would rate him above all the current justices. There are loads of persons capable of distinction as Supreme Court justices; no need for octogenarians. What is a danger as emphasized by Judge Rakoff is the prospect of Congress frequently changing the mandatory retirement age. But Congress could set 80 and provide in the statute that the age could not be changed without a supermajority voting to change it. Cohen: Obviously, you both have strong views on who has been an influential judge (justice). And we will all probably agree that it takes a reasonably long or longer tenure to become one. But to return to my original question, and despite a number of extraordinary but aging federal judges (particularly ones I know and cherish in New York), is there a point where age risks catching up with judges or justices, and the public may be better served by calling time? Posner: First of all, I don’t think Article III’s reference to federal judges serving “during good Behaviour” need be equated to life tenure. It may be read just to mean they can be fired at any age for bad performance. Thus interpreted, the Constitution (which is plastic) does not confer life tenure on federal judges. Also, while many judges and justices have performed OK in old age, I don’t think any of them improved with age, which means they could readily have been replaced with equally good or better judges. (They may have seemed to improve with age but only because the cases became more difficult over time and so opinions deciding them were richer, more interesting.) There are 1.3 million lawyers in the U.S., an enormous pool. Nor should appointment to federal courts including the Supreme Court be limited to lawyers. A brilliant businessman, a brilliant politician, a brilliant teacher might make an excellent judge or justice and greatly improve a court, relying on brilliant law clerks for the legal technicalities, which anyway receive far more attention from judges than they should, because most of the technicalities are antiquated crap. Rakoff: Jeepers, I’m a little taken aback by Judge Posner’s salvo. To begin with, I think Article III has always been read as conferring life tenure on federal judges—and, as I pointed out at the start of this exchange, it is a very good thing, for it guarantees the judicial independence that most judiciaries in the world lack. Second, I respectfully disagree that Supreme Court justices don’t improve with age; on the contrary, many of them gain a broader perspective than they had when they went on the bench, and this enables them to pierce through the technicalities of which Judge Posner complains, so they can see the woods instead of the trees. As Justice Holmes so famously said, “The life of the law has not been logic: it has been experience.” I know that I am a better judge now than when I first went on the bench 21 years ago, because of the lessons I have learned through experience, and I suspect the same is true of most judges, even those as brilliant as Judge Posner. Third, I doubt very much that a person who, however brilliant, was not a lawyer would make a good Supreme Court justice, any more than an engineer, however brilliant, would make a good surgeon. From the day they enter law school, lawyers not only learn the legal methods and processes that are necessary to the proper practice and interpretation of law but also learn some very important lessons that are too little taught elsewhere: that there is something to be said for each side of most issues; that careful distinctions therefore matter; that a decision that cannot be supported by reason is essentially lawless; that in the long run the fairness of procedures is as important as the substantive results; that being a good judge is not a popularity contest; and that protecting the rule of law requires eternal vigilance. It is hardly surprising that in every country of the world, it has been the lawyers who have been in the forefront of confronting despots and promoting liberty, and, as July Fourth reminds us, our country was no exception. I would not be happy entrusting the rule of law to a legal rookie. Posner: When Judge Rakoff says, “Life tenure is what guarantees federal judges their independence, enabling them to speak their minds freely, administer justice without fear or favor, and provide necessary checks on the other branches of government,” he is not, I think, describing the judiciary accurately. Judges are not really independent, do not speak their minds freely, and are not without fear or favor. Many of them (of us) worry about being reversed or overruled, about being criticized, about their colleagues, about legislators and other politicians, about their salaries, about retirement, about their treatment by the media and even the legal professoriate. In other words, they (we) are human! As for improving with age, I don’t think Blackmun, Stevens, or Souter did, though I do think that judges tend to improve with experience up to a point—an essential qualification. I do think that many highly intelligent businesspeople, technologists, legislators, and other government officials would make for fine judges; our current Supreme Court would be greatly improved if in lieu of the weaker justices we had one from each of the nonlawyer groups I’ve just listed. I strongly disagree with the following: “that there is something to be said for each side of most issues; that careful distinctions therefore matter; that a decision that cannot be supported by reason is essentially lawless; that in the long run the fairness of procedures is as important as the substantive results; that being a good judge is not a popularity contest; and that protecting the rule of law requires eternal vigilance. It is hardly surprising that in every country of the world, it has been the lawyers who have been in the forefront of confronting despots and promoting liberty, and, as July Fourth reminds us, our country was no exception.” I think most of what I’ve just quoted is flatly wrong. It’s not true that there’s something to be said for each side of most issues; that a decision must be supported by “reason,” whatever that means exactly, to avoid lawlessness; personally, I prefer common sense to “reason.” I don’t think popularity figures much in law. And as for the proposition “that in every country of the world, it has been the lawyers who have been in the forefront of confronting despots and promoting liberty,” I would like to see some evidence for this proposition, which strikes me, frankly, as preposterous. Rakoff: Judge Posner may be a hard-nosed “realist,” or maybe just a cynic, but I am amazed that he disagrees with the basic proposition that a judge who doesn’t exercise reason is lawless. Why do we hand over to judges the power to resolve important disputes if it is not because we expect them to put aside their biases, whims, and predilections (often masquerading as “common sense”) and apply, as best they can, reason and precedent to decide the issues before them? It is because of adherence to this requirement that every judge I know, including myself, sometimes reaches results that are different from how we would decide if we were writing “on a clean slate,” because we recognize our sworn obligation is to apply the law as our exercise of reason tells us it is, not as we might like it to be. As for the historic role of lawyers in fighting for liberty, if Judge Posner had talked (as I have) with the brave lawyers in China, the Middle East, the former Soviet Union, and elsewhere who, at real risk of imprisonment, are fighting today for liberty in autocratic and totalitarian states, he would recognize how legal training and devotion to the law leads lawyers to be in the forefront of the battle for liberty. And as for history, even putting aside the fact that the great majority of our Founding Fathers were lawyers, let me mention, as just one example, the great man on whom I wrote my master’s thesis, Mahatma Gandhi. The groundwork and inspiration for his mighty movement was provided by (a) the Indian nationalist lawyers who first fought for self-rule in India in the late 19th century and (b) his own work as a civil rights lawyer in South Africa before returning to India in 1915 to launch his freedom struggle. It was Gandhi’s legal training, more than anything else, that led him to realize that civil disobedience, if it is to be morally acceptable and politically successful, must be both peaceful and accepting of the legal consequences. I’m sorry, Judge Posner, but in my mind, a love of the law and a love of liberty are inextricably intertwined. Cohen: A postscript: As stated by Chief Justice William Rehnquist in his eulogy for Justice Lewis Powell Jr., Justice Powell, in facing retirement, expressed “on many occasions that he wanted to make sure he did not fall prey to a common malady of powerful people as they grow older—the inability to recognize the effects of age on one’s abilities. … As he advanced in years, Justice Powell sought the advice of others—physicians, family and former clerks—to make sure he did not ‘overstay his welcome.’ ” Powell retired, suddenly, at age 79, stating concerns about his age and failing health. If all of us, in whatever profession, had Powell’s commitment to duty, a discussion of age limits would likely be unnecessary.